For eczema and itchy irritating dry skin conditions. Soothes, softens & rehydrates. Relieves itching. Suitable for adults & children. Fragrance free. Oilatum Cream is an emollient (softening, soothing agent) used in the treatment of eczema, dermatitis and dry skin including ichthyosis. It will help to moisturize the skin after washing and is suitable for people allergic to lanolin. 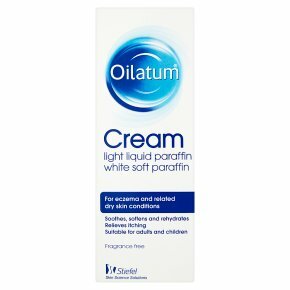 Oilatum Cream for eczema and related dry skin conditions. Starts soothing immediately. Clinically proven care for visibly healthier dry skin. Oilatum Cream is designed to treat your eczema prone skin and dry skin by forming a protective film to moisturise the skin to soothe, soften and hydrate. Oilatum Cream is clinically tested to significantly reduce itching for 8 hours (1). 85% of women agree Oilatum Cream improved the condition of their skin. Oilatum Cream is fragrance-free and suitable for both adults and children. To use, apply to affected area. Use as often as required. Suitable for moisturising skin after washing, to counteract the loss of water from the skin. Oilatum Cream is a medicine for eczema and related dry skin conditions. Always read the label. (1) study conducted in adults with dry itchy skin. Directions Apply to the affected area. Use as often as required or as directed by your pharmacist or doctor. Oilatum Cream is especially effective if applied immediately after washing, to counteract the loss of essential oils from the skin. Oilatum Cream is suitable for adults and children. Warnings<br>Avoid using the product if you are sensitive to any of the ingredients.<br>If an adult uses this product whilst breast-feeding, wash all traces prior to feeding.<br><br>Reporting of side effects<br>If you get any side effects, talk to your doctor, pharmacist or nurse. This includes any possible side effects not listed on this carton. You can also report side effects directly via the Yellow Card Scheme at: www.mhra.gov.uk/yellowcard.<br>By reporting side effects you can help provide more information on the safety of this medicine.<br><br>Use this medicine only on your skin.<br>KEEP OUT OF THE SIGHT AND REACH OF CHILDREN.<br><br>Do not use the product after the expiry date.